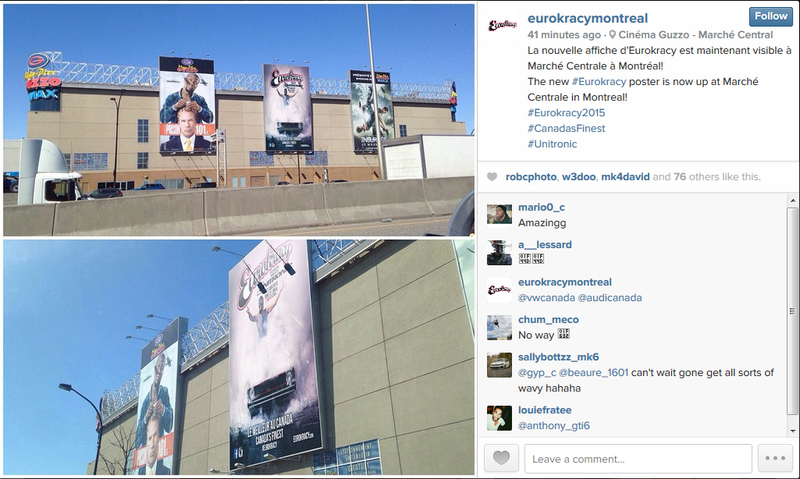 A number of you may have noticed our recent Facebook & Instagram post regarding a new Eurokracy advertisement at Marché Centrale in Montréal, Canada. Well we hate to do this to everyone but this was indeed a big April Fools prank. Now this isn’t to say we didn’t make a poster to promote the upcoming premiere of the Eurokracy 2015 trailer however we just wanted to show the world how one small dream turned into a big reality in a creative way. As thanks for putting up with this prank and for the years of support, we’ve decided to give away the new Eurokracy poster for FREE online for everyone to download and print off on their own. Big thanks to Sam Dobbins for taking the photos used to assemble this poster, as well as Mick Collins and Pierre-Olivier Gobeil for lighting up their MK1 GTI. Vous avez surement remarqué notre récent annonce sur Facebook ou Instagram par rapport a la publicité d’Eurokracy au Marche Centrale a Montréal. Nous sommes désoler de vous annoncer que c’était simplement un Poison d’Avril . Cela ne veut pas que nous avons pas crée un Poster pour la première de la bande d’annonce Eurokracy 2015 au cinémas Guzzo. Nous voulons par contre montrer a tous comment un rêve de 3 passionnée euro est devenue réalité. Pour vous remercier de votre support continue au cours de toutes ces années nous avons décider d’offrir le tout nouveau poster de Eurokracy Gratuitement en ligne de cette façon tous peuvent le télécharger ou l’imprimer sans frais. Ne voulons donner un merci spécial a Sam Dubbins pour la photo et a Mick Collins et Pierre-Oilivier Gobeil pour avoir allumer l’asphalte dans leur GTI MK1.